A chance to acquire another of the more interesting colourways in this series of Novelty Tableware from Carlton Ware. 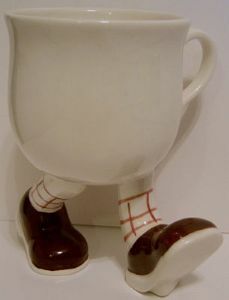 This is a Tea Cup from the RJS Series made by Lustre Pottery and Carlton Ware and, as usual, designed by Roger Michell (Lustre Pottery) and produced in 1980. The cup appears to be running along. It has pink and white checked socks with brown shoes. It is appropriately backstamped and dated 1980.